The gallbladder is a little sac which lies between the two lobes of your liver and stores bile made by the liver. It’s not useless and should not be removed unless under dire circumstances. Just like your tonsils, adenoids, appendix and other so-called ‘useless’ organs. These all serve a purpose. Bile used to be called gall, hence a bladder to store gall. You could also call it a bile-bladder for that matter! 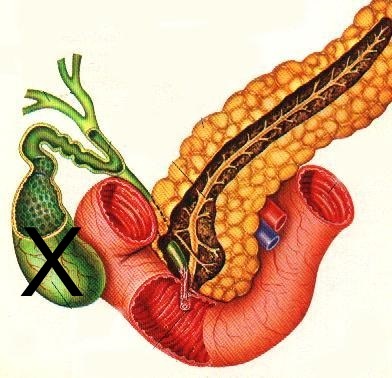 You can live without one clearly, millions do – but once the gallbladder is removed the bile made by the liver can no longer be stored between meals and it will then flow directly into the intestine, although there will be less than you’d get from a fully-functioning gallbladder. Most people cope really well while others battle for years after surgery, generally with fatty diarrhea. Ideally you will have to make adjustments and ease into more fat with time, but it does not mean you cannot eat fat anymore by any means. Although you’ll be told to go on a high fibre, low fat diet, this is not the best diet for those without a gallbladder. The first few days after removal yes, have clear liquids and foods easy to digest, and then gradually add solids back into your diet. For a while eat more often, and have smaller meals until your body is able to adapt to higher fat meals. If you can, get hold of an ox bile supplement which is very helpful. The Solgar Digestive Enzymes are a great way to get ox bile as it’s something we don’t get on its own in this country easily. Don’t rush into having this surgery if you can save your gallbladder through diet as your risk of NAFLD (non-alcoholic fatty liver disease) is raised, but by following a low-carb diet as set out in The Low-Carb Creed book you will avoid that. But if you have had to have it out, don’t have too much fat the first month, increase it slowly, and take enzymes with ox-bile. Taking MCT oil such as the lovely Medium Chain Triglyceride oil in my online store will provide easy-to-digest fat, and be properly absorbed. Have some fresh ginger tea with meals to improve fat digestion and remain hydrated. Best of all save your gallbladder BEFORE it gives trouble, and follow a low-carb, medium healthy fat, medium protein diet. A good supplement for liver and gallbladder health (even after the gallbladder is removed) is Milk Thistle with Dandelion – find it here – or use just Milk Thistle.